Ever hear of the crop tool Mattel? I didn’t see this posted on a lot of websites, now that I have the time I wanted to pass along what Mattel posted on their Facebook page, which was later updated to suppress an already niche collector market. I don’t know if Mattel will actually make good on their scare tactic, as the Ecto-1 pre-sale page still reads November 5, 2013 as the deadline. I understand the pre-ordering and gauging interest to see what it may cost to produce Ecto-1, which no ghosthead thought Mattel would even attempt to make with an understanding that Ghostbusters™ more or less is a dead (no pun intended) franchise to them. And what they’re trying to do is nothing like a “Kickstarter” campaign. Did they even look to see how Kickstarter or similar web sites actually work? We have no idea how many customers are pre-ordering their Ecto-1 or the new 6” figures most ghostheads don’t need. That is a difference between Kickstarter and similar sites to Mattel’s business strategies. 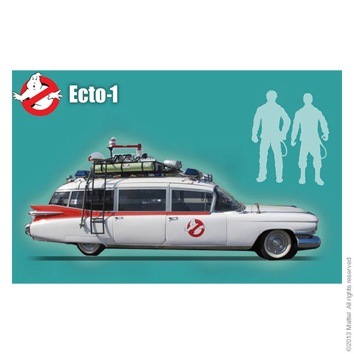 None of us really know how this Ecto-1 will turn out, we’ve barely seen a model of it. They cut the deadline to try to increase pre-orders and try to reach their goal in less then 4 months. Yes it take times to create and make these expensive, quality collectors toys. Their could have been a 4 month pre-order earlier in the year so Mattel would have the time for the “logistics” in “the toy making process.” Then their would have been plenty of time before Matty Collector would actually sell them and at this years comic con we could have seen an early prototype, not some cardboard graphic and a “foam” block. Unless something changes I won’t be pre-ordering the Ecto-1 and I don’t need 6” figures with removable packs just so they can sit nicely in the car. I’m a real Ghostbuster, I don’t scare easily.